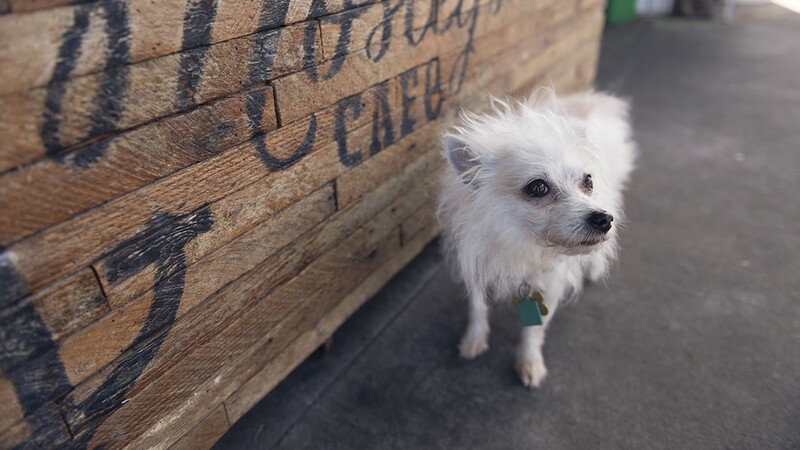 Enjoy the summer with good food and drinks outside — with your best furry friend. Drake’s Dealership is well-known for welcoming pups onto its spacious patio. It's always a huge bummer when you find out that awesome, dog-friendly restaurant "patio" you've heard about is actually just two tiny tables on a sidewalk. Fortunately, there are quite a few legitimately spacious patios that allow you to eat a delicious meal with your pooch while enjoying the East Bay's partly sunny summer skies. Look for patio seating in front of the restaurant as opposed to in the back — dogs can't go inside a food service establishment, even just to pass through briefly. In no particular order, here are 10 of our favorites. Last year, the owners of Homegrown Oakland spiffed up the former Grease Box spot to debut this laid-back, kid-friendly restaurant serving comfort food: burgers, wings, sandwiches, and tacos, plus local beers on tap. As far as patios go, this North Oakland ditty is especially spacious — there's plenty of room for kids to run around and dogs to stretch their paws while the adults take advantage of Sideshow's impressive game selection. A little-known haunt parked on a dock in Alameda, Mosley's Cafe is an exceedingly peaceful spot where time seems to stand still — the only hint otherwise is the boats and kayakers gliding along the estuary. Come for simple breakfast dishes, sandwiches, crepes, and a surprisingly strong selection of gluten-free pastries. And, while it might be summer, you should probably bring a jacket. Another eatery located right on the water — but on the Oakland side of the estuary, along the Bay Trail — Brotzeit Lokal is a Bavarian-inspired biergarten with roughly 20 beers on draft. Dinner emphasizes sausages with sauerkraut, though there are other German dishes and American standards. Seating is all beer garden-style. Maybe it's the central location in Oakland's The Hive complex, or maybe it's the enduring popularity of Drake's beer, but this beer garden is always bumpin'. The thin-crust pizzas are nicely charred and loaded with fun, eclectic toppings, but there are also fresh salads, burgers, and creative spins on weekend brunch classics — and, of course, an epic selection of Drake's beer. The outdoor space is enormous, with a mix of large picnic tables, four-tops, and casual bench seating by a fire pit. At Navi Kitchen, Preeti Mistry's follow-up to Juhu Beach Club, sourdough pizzas are loaded up with bold, Indian flavors. They can easily feed two or three people, making Navi an ideal spot for group lunches this summer — most of the restaurant's seating is comprised of picnic tables on a sunny, roomy patio. Access it with your pup through a door to the left of the main entrance. It's easy to walk by Tomate Cafe without even realizing it's there — let alone that there's a huge, semi-hidden patio right in front. Surrounded by greenery, the place avoids feeling as industrial as you might fear given its warehouse-filled location in West Berkeley. The fact that it's enclosed, though, does wonders on a windy day. Breakfasts are generally simple, American egg plates, while lunch offers more global flavors. With a picturesque, waterfront view on Jack London Square, Forge offers a range of outdoor seating options, including water-facing, bar-style tables and cushy lounge seats around a fire pit. It's tough to beat the shade setup, and the market lights give it a warm glow at night. There's pizza and a full bar — all alcoholic beverages seem to pair well with Forge's fried cheese curds. You'll probably have to wait in line for brunch at La Note, but the reward is one of the loveliest patios in Berkeley. With its canary yellow walls, bounty of greenery, and cornflower blue umbrellas, it feels as French as the food. Bring your pooch through an alleyway to the left of the main entrance. While primarily known for its crepes, Maison Bleue also serves a variety of sandwiches, breakfast dishes, and imported French pastries as well as beer and wine. All are well-suited to enjoy on the cafe's large front patio, which offers a nice mix of sun and shade in downtown Berkeley. The roomy layout gives dogs space to stretch out, but the selection of small, two-person tables helps it feel intimate. On a quieter stretch of Grand Avenue, Grand Tavern's front patio offers laid-back people-watching opportunities with warm, neighborhood vibes. Find beer, wine, locally made spirits, and unfussy cocktails along with burger-centric dinners, brunch, and a solid selection of vegetarian and gluten-free options. If you have a larger dog, note that the space is on the cozy side.